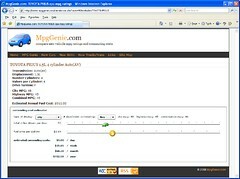 Have some new updates to MpgGenie.com. You can now view an Adobe Flex application that dynamically shows commuting costs on the individual vehicle pages. Here is the page for the Toyota Prius Hybrid-Electric car.